It adds four blockheads to the classic dungeon-crawler formula. 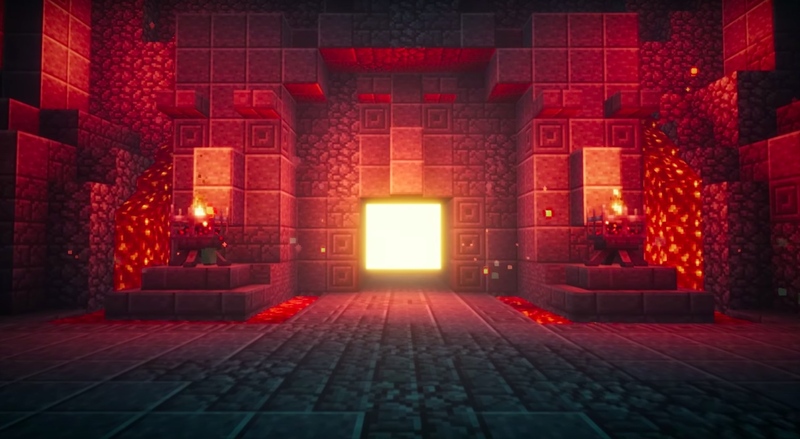 The new game from Mojang answers the eternal question, what if Minecraft and Gauntlet had a baby? 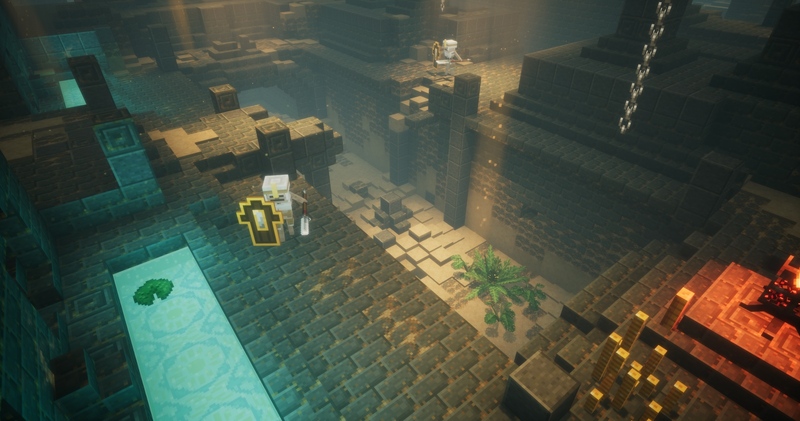 Minecraft: Dungeons is a brand-new game inspired by classic dungeon crawlers like Wizardry and Ultima Underworld, and it turns the series' traditional formula on its head. Instead of providing a vast, open canvas where players can let their imaginations run wild, Dungeons is an adventure game filled with discrete quests, characters, items and enemies. It still looks like classic Minecraft fare, complete with cube-headed characters and 3D swords with jagged, pixelated blades. While players are free to explore this new blocky universe, Dungeons is decidedly not an open-world game. It is, however, a passion project for a small team at Mojang, according to Chief Creative Officer Jens Bergensten. "When I think about Minecraft, I essentially think about it as the multiverse, like multiple universes," Bergensten said on a phone call just days before revealing Dungeons at Minecon 2018. "Dungeons is essentially one Minecraft world with specific areas to go to and specific quests and specific monsters. That said, there are of course procedural elements to the game, but it's not an open-world game that Minecraft is." Dungeons can be played solo or with up to three other people online; there's no local co-op mode. It's due to hit PC in 2019. Dungeons isn't the only Minecraft spin-off in town. Mojang and Microsoft, the studio's parent company since 2014, have long been exploring new worlds in the Minecraft multiverse, most notably with Minecraft: Story Mode. 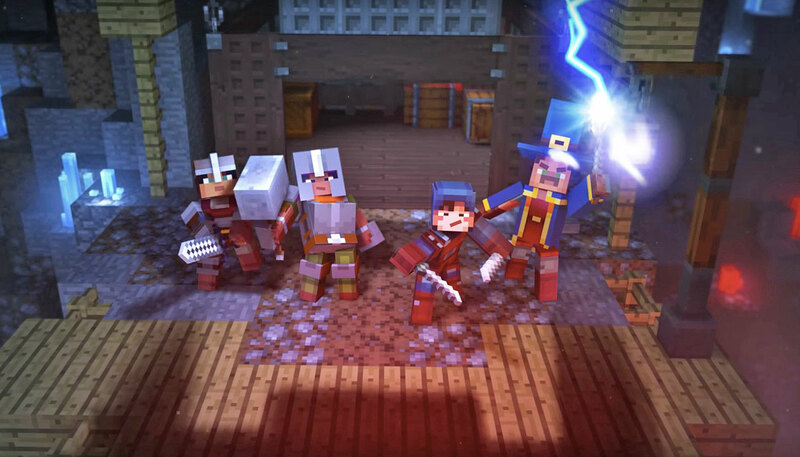 Story Mode transforms Minecraft into a narrative-driven adventure game, complete with top-tier voice actors Patton Oswalt, Catherine Taber, Ashley Johnson and Brian Posehn. The first season kicked off in December 2015, while the final episode of the second season landed in December 2017. It isn't an internal project -- instead, Telltale Games, the studio behind The Walking Dead and Wolf Among Us, took on the challenge. Story Mode performed well critically and commercially, but Telltale itself has fallen apart. The studio laid off more than 200 employees, or 90 percent of its staff, earlier in September. A team of just 25 people is staying on to tie up loose ends and hopefully finish the final season of The Walking Dead. This skeleton crew is also wrapping up Minecraft: Story Mode. "They continue to have a team that is working on bringing Story Mode to Netflix," Microsoft's Minecraft head Helen Chiang said. "It is the same Story Mode that you have seen and known and loved across all of the other platforms, but it's adapted to the Netflix interface. That's what they're focused on and that's kind of the continuation of Story Mode." Mojang and Microsoft are more interested in expanding the Minecraft universe from within, rather than contracting outside studios, Chiang said. This is precisely how we've ended up with Bergensten's passion project, Minecraft: Dungeons. As a franchise, Minecraft is poised to continue growing from here. Despite originally launching nine years ago as an in-progress Java project, the core Minecraft game recently hit 91 million monthly active users, and lifetime sales are at 154 million (and counting). It's playable on every major platform, including mobile and consoles, and Microsoft has implemented cross-play among PC, mobile, Xbox One and Nintendo Switch. Sony has historically refused to open up the PlayStation 4 to cross-platform play, though this week it caved in the case of one incredibly popular game -- Fortnite. If all goes well in Sony's Fortnite experiment, Minecraft could be an ideal candidate for expanding PlayStation-specific cross-play. However, Chiang said there were no updates on that front for now. "Our goal has always been to unite players, no matter what device or platform they're playing on, and really bringing the Minecraft community together," Chiang said. "We would love to bring players on PlayStation into that ecosystem as well." But that's all about the core Minecraft experience. There's no word on whether Minecraft: Dungeons will make its way to platforms other than PC, but Microsoft isn't likely to let potential revenue die on the vine. If Dungeons finds a hungry audience on PC next year, additional consoles will be sure to follow -- perhaps even with cross-play built in.